Want to "Re-Charge" or Marinate those soft plastic baits? Just add 8 or 10 drops to a regular pack of baits, mix them around and let them sit for a couple days. 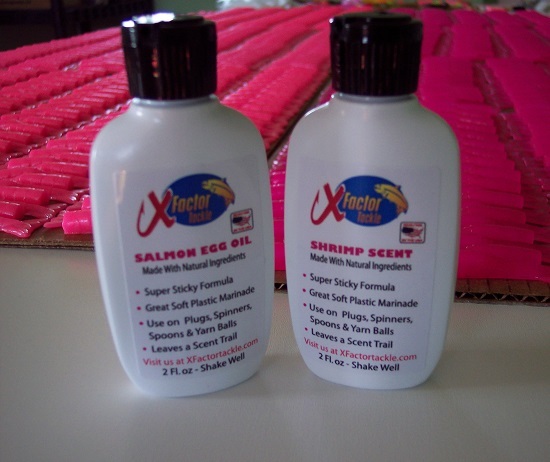 The plastic will soak up the scent giving you a durable artificial bait with a natural scent. This is the same formula that we use in our packaging. It's an all natural, highly concentrated liquid scent, not a gel. Also works great on plugs, yarn, spinners, spoons, etc. Absolutely love this product. Way better then any other scents I've used. Jeff is a pretty awesome guy as well. This stuff works great.salmon tear it up. Q: Hi there, I'm looking to order your scents, but not sure which one would work better with soft beads (egg clusters) and which one would work better with pink worms. Can you please advice which one to use for which baits? Thanks, Roman PS I assume you ship to Canada, right? I would just use the Shrimp scent for both. It's very potent and fish love it. We do ship to Canada. Let us know if you have any other questions.